Here is one of only a few TTB-approved beverages made with yerba mate. Yerba mate is one of the most popular natural sources of caffeine in subtropical South America, especially Argentina and Paraguay. Yerba mate leaves can be used to make an infusion that resembles green tea, although much stronger. Yerba mate has about 50 mg of caffeine per six-ounce cup. By contrast, a cup of brewed coffee has about 2-3 times more caffeine. 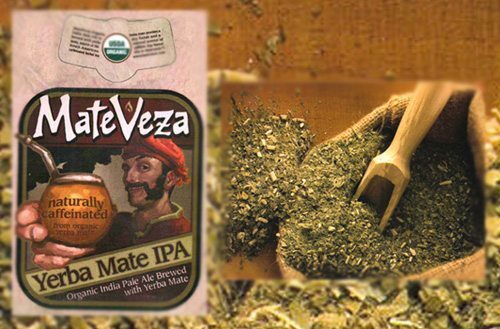 MateVeza is an “Organic India Pale Ale Brewed with Yerba Mate.” The label says it is “naturally caffeinated.” It is made by Mendocino Brewing in Ukiah, California. About Yerba Mate, only Uruguay, South of Brasil and Argentina drink “Mate”, Paraguay drink something called “te-re-re” is different way. Mate is a plant where is prepared and cured to fill-up with yerba.